Official in ruling party says Likud is planning a right-wing government and is already in advanced contacts with its coalition partners. A Likud official on Wednesday evening commented on the party’s victory in the elections and said it was "a huge achievement for the Likud and Netanyahu." "Netanyahu will establish a right-wing government and he is already in advanced negotiations with the partners of the nationalist camp," said the official. The source clarified that the Likud is looking at four years of a ruling coalition, no less. 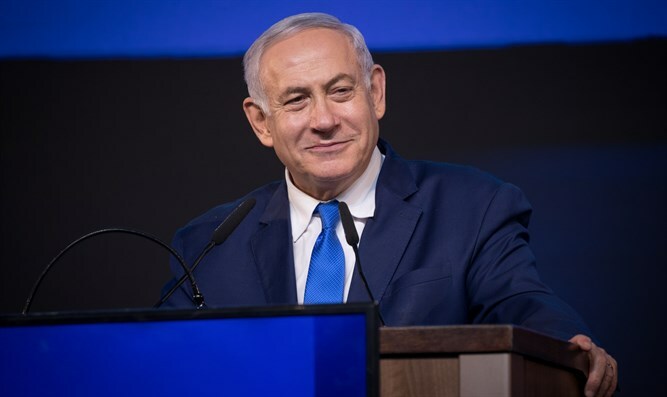 "The Israeli public has spoken and expressed its full trust in Netanyahu and gave him an unequivocal mandate to continue to lead the State of Israel to tremendous achievements over the next four years. We are going for a full term,” said the official. Prime Minister Netanyahu spoke earlier on Wednesday with US President Donald Trump who called him and congratulated him on his victory. US Vice President Mike Pence also called Netanyahu to congratulate him on his election victory. The US Vice President told the Prime Minister that he appreciates his leadership and joint work with US President Trump to advance the strong alliance between the US and Israel.